It was a spectacular day for a hike! It was in conjunction with the Piedmont Environmental Council’s Mountain Heritage event at Graves Mill. It was a special weekend with music, family photographs, oral histories, and tours of the chapel and mill. This event celebrated the mountain farms and families who lived and worked there prior to the Shenandoah Park. For this hike, we had a special group ranging from 9 year old Cameron Dudley and 17 year old soccer player Alex Dudley to a guest hiker, Steve Bair, District Manger of blue blaze trails in the South District. With the energy of youth, and the knowledge of a veteran trail maintainer, we were treated to side bushwhacks to cemeteries and stories of the people who lived in the area. Steve said that there are 100 cemeteries in the SNP, but only 4 still active. Most of then have simple field stone markers, and are usually found from the periwinkle groundcover. Steve also noted the site of the Big Bridge that used to cross the Rapidan River. As we climbed the trail up the Staunton, we spotted a water testing station that UVa is using to monitor water quality and flow. The trail was in wonderful shape, and at the start there were lots of wildflowers. It was the perfect day for a strolling ascent up the Staunton River. We enjoyed a snack, visited another hidden cemetery, and then took on our big ascent. Led by Alex, we climbed toward the Jones Mtn cabin, 3 ½ miles from the parking lot. No one was at the cabin, so we had our picnic lunch in front, beside the spring. Steve shared more stories of the layout of the area during the times of Harvey Nichols, the moonshiner who last lived there. This cabin had been forgotten after he was forced out, and it wasn’t until the 1970’s that it was rediscovered, and eventually rebuilt by the PATC. We visited the site of his 2nd wife, Cricket’s, grave as we returned. The PATC has a wonderful book "Lost Trails and Forgotten People: The Story of Jones Mtn." about this area and the scores of families who lived in Madison County. Others who enjoyed the hike were Barbara Dudley, Dan Funkhouser, CJ Woodburn, David Crowe, Neil McKinney, Art Bykonen, Jeanne Siler, first time hiker Megan Davis, and Dave Borszich. Working the PATC display table while we hiked were Bill Holman and Rich Bard, along with Kodi, a chocolate lab. Was it the cold and threat of rain that kept most people away? 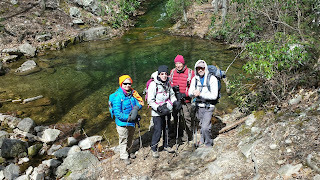 While we had both a long and short hike scheduled, we only had 2 hikers who both wanted a short hike, so hike leaders Mark Trail and Iva Gillet changed hikes and lead Jeanne Siler and Eileen Seaman on a short hike to South River Falls. While a bit threatening early on, as we descended the trail, not much rain ever arrived. We were able to watch spring unfold as we lost elevation, with redbuds blooming as we viewed the top of the falls. 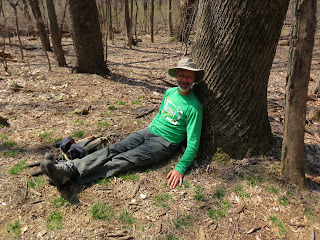 A snack here, and then down we went finding some trilliums, Dutchman’s breeches, bloodroot, and other signs of spring. We had lunch at the base of the falls, enjoying some of Mark’s stories of his various thru hikes and plans for his upcoming cross country bike ride. He plans to bike from Virginia to Oregon in 3 months, and then pedal from west to east, ending in Bar Harbor, Maine in September. After we shored up with chocolate, and as others began to arrive at the Falls, we began the trek UP the fire road. The sun was out now, and we were seeing a few more folks on the trail. 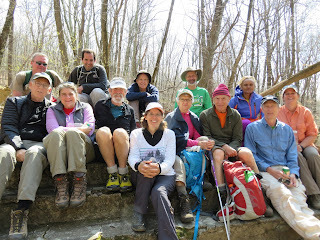 Great conversation, a few breath breaks, and in no time we were on the AT heading back. We were done by 2 PM, so off to other weekend activities. Due to a rainy forecast AND the Skyline Drive being closed, our joint hike with the Valley Chapter was cancelled and we each led hikes on our respective sides of the mountain. 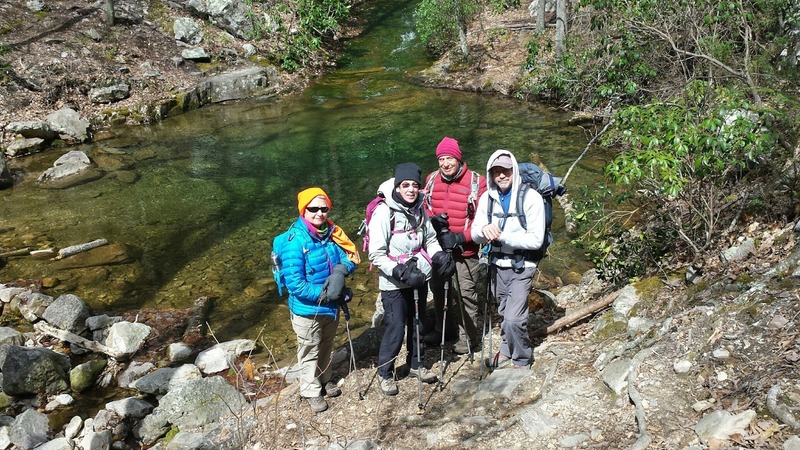 Our brave hiking souls this day were Ginny Barber, Nancy Handley, and Brian Muszynski, joining hike leaders Bill Holman and Iva Gillet. With limited Park access, we headed to Sugar Hollow for a planned hike up to the Drive at Turk Gap. Remi, Iva’s granddog, was so happy to play in the stream and didn’t mind the rainy forecast at all. Brian crossed the Moorman’s River 2 or 3 times while the rest of us looked for an easy crossing, finally deciding to head north instead. We enjoyed the lovely flow of the water and some conversation. We crossed the river a few times and then turned around. Bill found a terrific rock overhang where we enjoyed some snacks, and shared with Remi. Back to the cars before the serious rain came, we were glad for a few hours walking in nature before we returned to our chores. Only a few tough souls met on this windy cold day in April to go on a favorite hike. We did a short car shuttle so Bev and Pete Fink could stop at Rip Rap parking while Anne Colgate, Charles Staples and Kelly O’Rourke hiked the entire 9.5 mile loop. We ate lunch at one of the many waterfalls and saw a surprising number of stout backpackers who were not daunted by the 19 degree prediction for Sat. night. We also saw a couple through hikers. The water was not high so the stream crossings were pretty easy. When we started the temp reading hovered between 27 and 30, and the wind chill made it much colder. Still we all had a great time and were very glad to have ventured out! The weather was perfect for a bushwhack, followed by a steady climb, followed by hiking on a nice wide fire road. In the 60’s and sunny, 15 folks gathered at Mark Walkup’s residence in Greene County for an action and history packed day. 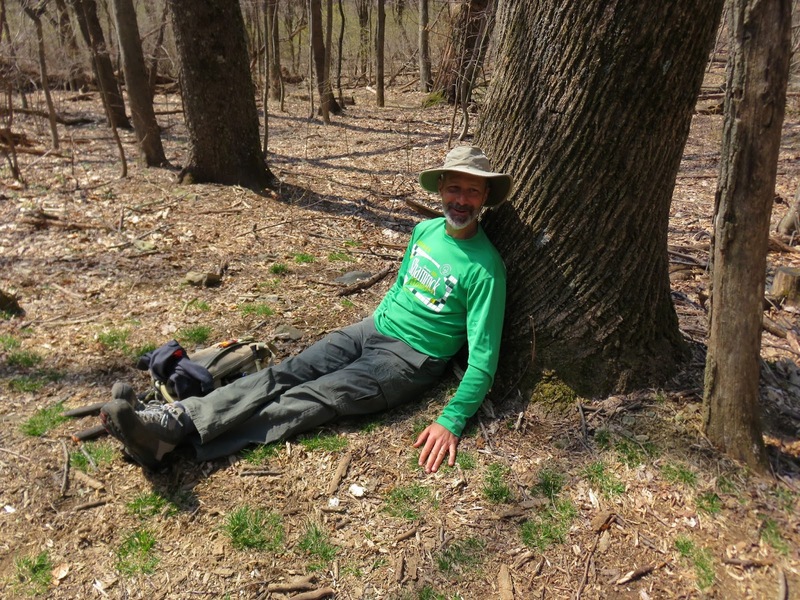 CairParavel Farm was the starting point for our new trail/bushwhack into PATC’s 244-acre Entry Run Tract for which Mark is the tract manager. A steep descent through boulders and near small caves was followed by a scenic ascent along a stream to a waterfall. Great pictures of Claire Cline, Todd Patrick, and Patrick Cory were taken here. Completing our off-trail section, we reached the John’s Rest trail which seemed very well traveled after the path so far. Passing by the lovely John’s Rest log cabin (relocated from West Virginia by PATC volunteers), we had a brief snack before a steady climb up the Entry Run Trail toward the SNP. Views were awesome as we followed Dan Funkhouser, Pat Choloski, CJ Woodburn and David Crowe up the trail. Bill Holman was sweep to keep us all together. Mark Trail hiked with us today as a prep for his TransAmerica bike ride beginning next week in Yorktown, Va and ending in San Diego, Ca. Iva Gillet enjoyed chatting with Jayne Mayne, joining us from Fredericksburg, and Neil McKinney, who was discussing medical mission trips. Rounding our group were the veteran hiking couple- Bev and Pete Fink. Along the way we passed the Lamb cemetery in the saddle of the ridgeline and the Rosser Lamb cabin (circa 1914), located in a poplar hollow near Entry Run. After climbing into SNP backcountry toward Lewis Mountain, we lunched at the ruins of the Upper Pocosin Mission’s school and chapel buildings, which formed a community center from 1905 until the creation of the SNP. A short retracing of our steps, and the group consensus was to descend on the fire road to avoid more of the hilly terrain. Our final point of interest was a house at the entrance to Rosser Lamb which was built from materials salvaged from the Lower Pocosin Mission. There is a lot of great local history in this area. Upon returning to the farm, Mark offered farm tours and refreshments to those who had the time. What a wonderful day we had on Pocosan Mountain, and many thanks to Mark Walkup for sharing his home and the history of the area.